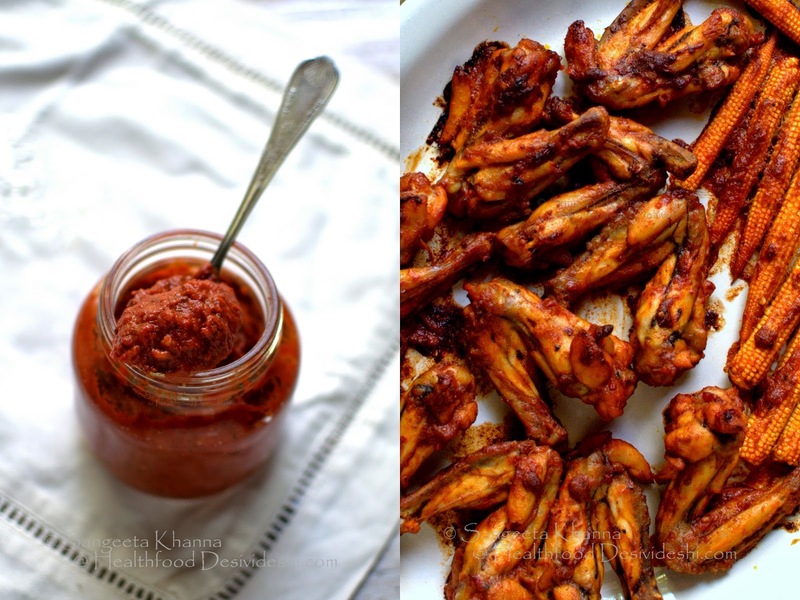 Piri piri sauce or peri peri sauce is a hot chilly sauce of Portuguese-African origin.The sauce uses African bird's eye chillies and Portuguese probably started making this sauce with the small bird's eye chillies in colonial times. Portuguese had colonies in Africa and they made great use of the local chillies. These bird's eye chillies are grown along the western coast of India as well and that is because the Portuguese brought this bird's eye chilly to Cochin and Goa. We find this chilly growing around Goa a lot, we brought some dry bird's eye chillies from there last time and grew seedlings. 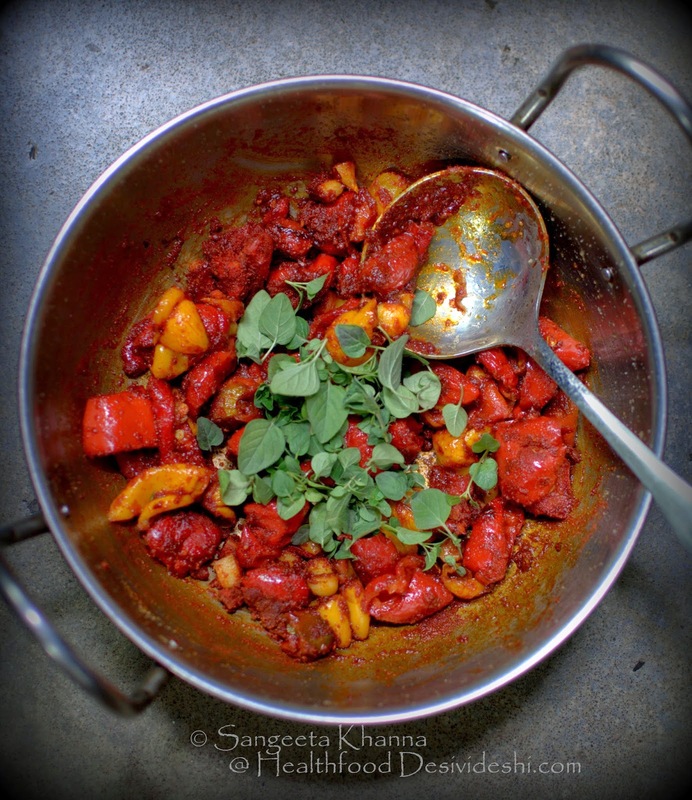 The chillies are quite hot and very flavourful. In Africa, the same chilly is called piri piri and the sauce made with these is spicy and hot and yet packed with flavours of chilly. Chicken grilled with piri piri sauce is a popular recipe. Piri piri sauce or peri peri sauce as it is pronounced sometimes, was made popular worldwide by Nando's and I am sure people like it with different heat levels in different parts of the world. 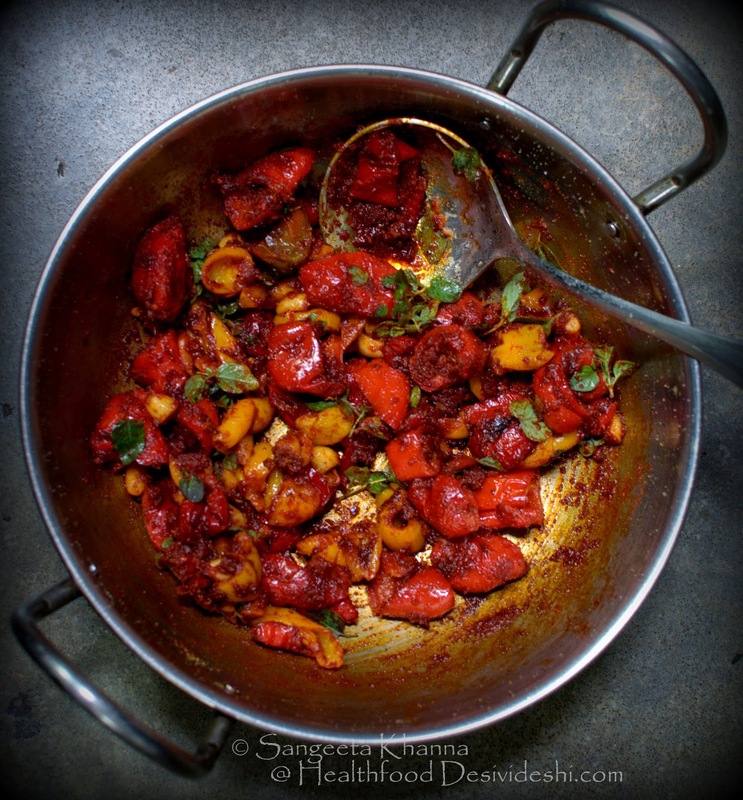 I have even tasted chicken piri piri with a hint of sweetness and that was also great. One can always adjust the heat in this sauce to one's liking and use more types of chillies to get a rich chilly flavour. 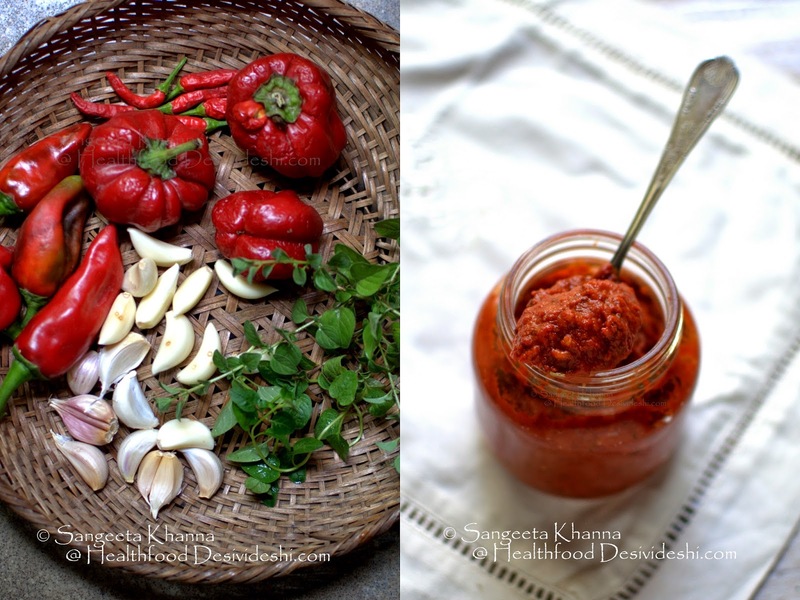 When Kashmiri chillies, bird's eye chillies, paprika and red bell peppers are used together you get a nice chilly flavour with a milder heat level. Most people find this kind of milder piri piri sauce better as it doesn't set the palate on fire. Those who like it hot, make it just with the bird's eye chillies. So choose your chillies to taste. I like using as many fresh red chilly varieties as I can get and always love this piri piri sauce with a generous garlic flavours. 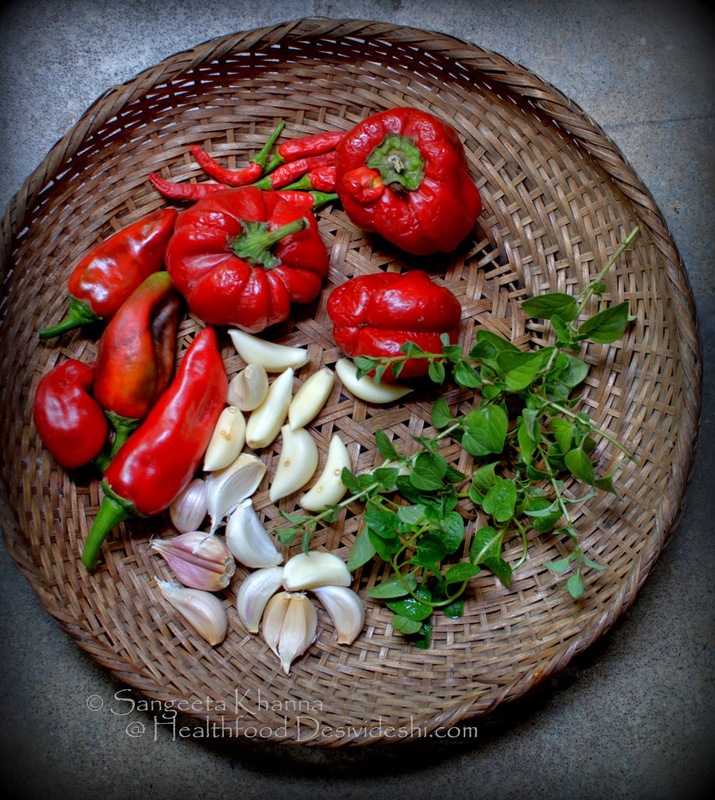 Recently I harvested a few red bell peppers, a few red jalapenos and habanero peppers from my kitchen garden. The chilly plants don't bear many fruits in my garden somehow so only 2-3 peppers of each variety were there. The bird's eye chilly plant keeps giving me about a dozen chillies every week so I planned to make the piri piri sauce with all of them mixed. Oregano is from the garden as well. The piri piri sauce recipe is simple, but you need the most flavourful chillies you can get your hands on. Bird's eye chilly is a must if you like it hot, else make it with a mix of red bell peppers and any mildly hot red chilly peppers available to you. I like using a yellow bell pepper in the mix to provide a nice vibrant colour to the sauce, bell peppers both red and yellow, basically enhance the colour and provide body to the sauce. And you know chilly peppers are one of the best anti inflammatory foods and full of antioxidants. Oregano is essential for this sauce and please don't replace it with any other herb. But if you want to use other herbs, go for mixed Italian herbs for a richer flavour. Chop the garlic roughly and all the chillies in large chunks. Pour the olive oil in a pan and add chopped garlic to it. Place it on the stove and wait till the garlic starts sizzling. Add the chopped bell peppers and chilly peppers together, add salt and stir well. Cook covered for 5 minutes. Add paprika powder, mix well and cook for a couple of minutes. Take the mixture off the heat and add the oregano leaves. Mix it well and let the mixture cool down. Now transfer the contents in a blender jar and blend till smooth. Add the vinegar while blending and let it make a smooth sauce. Transfer to a sterilised glass jar and close the lid. The sauce keeps well for a couple of weeks at room temperature and for a year when refrigerated. 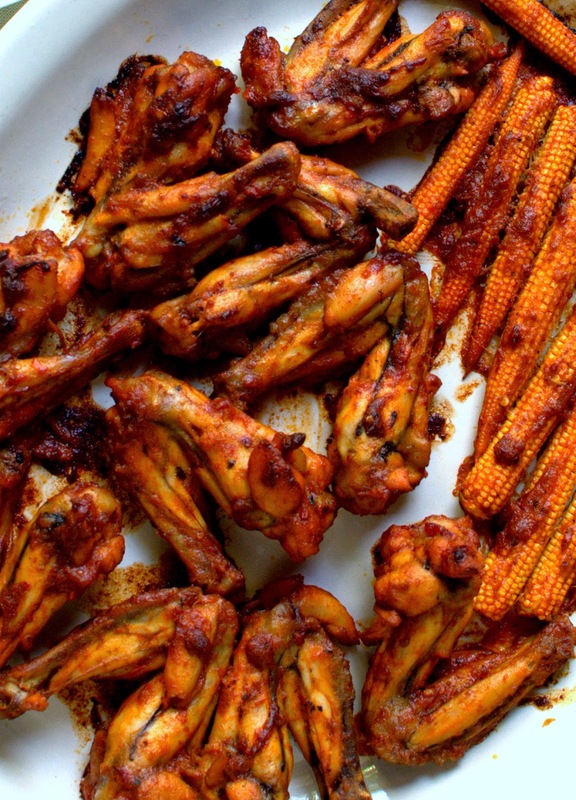 I made chicken wings grilled with piri piri sauce and threw in a few fresh baby corns as well. Simmer the chicken wings in a stock pot with the water and salt for a good 40 minutes. Add a little more water if required but the water should reduce to half a cup in the end. Take out the chicken wings and dissolve the piri piri sauce and olive oil in the remaining chicken stock left in the pot. Reduce it till it makes a sauce of coating consistency. Mix the chicken wings and let the sauce coat it all over. 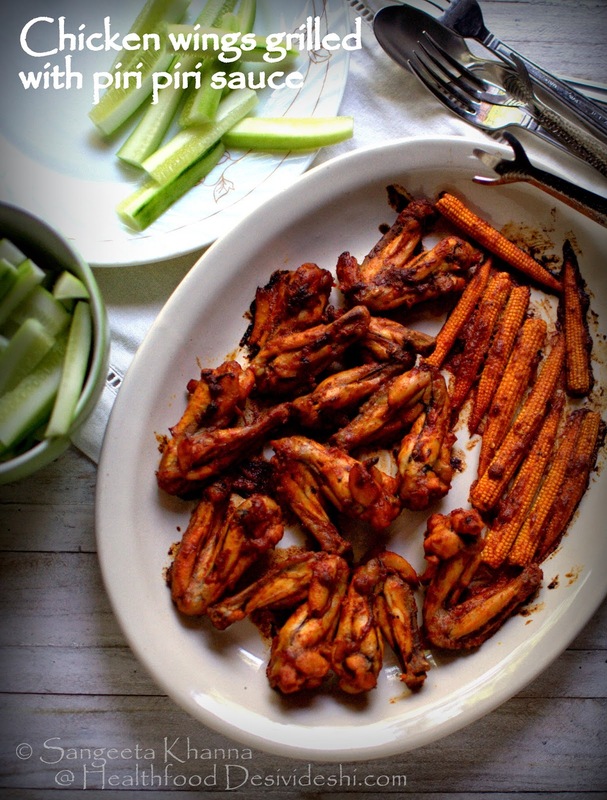 Spread all the chicken wings on a baking dish and bake at 200 C for 10 minutes or till the surface becomes a bit crisp. I added a few baby corns to the same sauce and grilled along with the chicken wings. It always makes a nice vegetarian version of piri piri grill. We love fish steaks grilled with piri piri sauce and potato or sweet potato wedges with piri piri sauce as well. Paneer batons also take the flavours well when grilled with piri piri sauce. These chicken wings grilled with piri piri sauce was enjoyed with batons of cucumber on the side and some chilled beer last weekend. It can be a great appetiser or a main course depending on how you want to enjoy it. Keeping some piri piri sauce in your fridge is a great idea if you want quick meals at the end of the day. Some chicken breast along with a few seasonal vegetables like lotus stem or even coclocasia would taste great with this sauce. 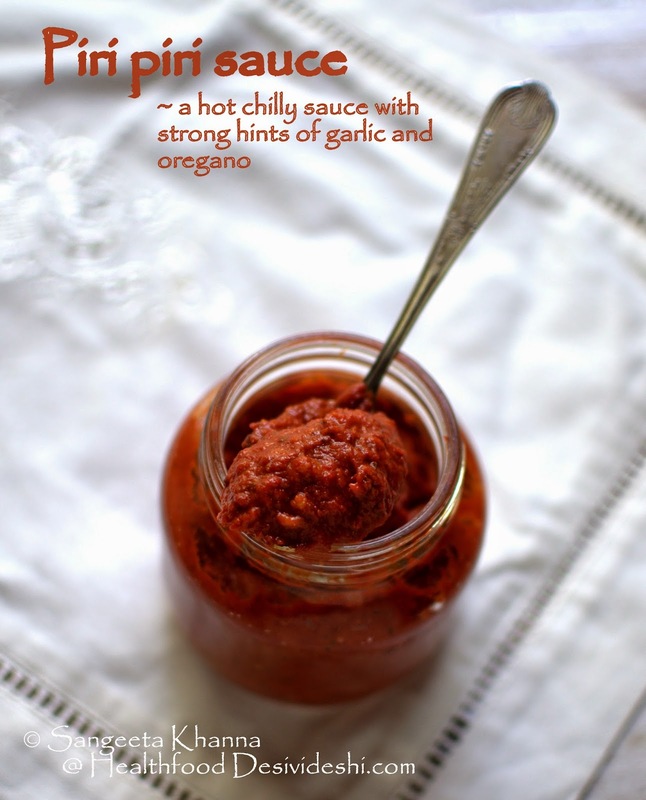 Piri piri sauce will be a favourite if you love chilly peppers. Make it and let me know if you like. I am loving some piri piri in the peak summer heat right now. Trust me it wont be as hot as you think, serve some cooling kind of side dishes with it if you have a doubt and see how the grilled chicken flies off the platter. Looks yummy as always - and simple to make! 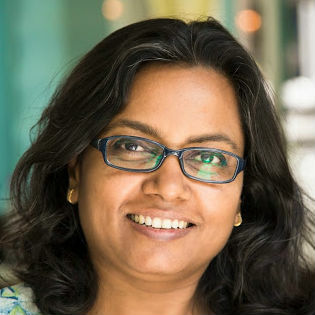 You are brilliant, Sangeeta!